A young boy from Northern Ireland was granted his wish to be a firefighter, with help from the UK’s leading manufacturer of protective workwear. Nine-year old Samuel Hawthorne spent a day with the Northern Ireland Fire & Rescue Service, and Stockport-based Ballyclare Limited provided him with a tailor-made firefighter’s uniform to wear on his big day. Ballyclare was approached to help Samuel by Make-A-Wish® UK, the charity that grants magical wishes to enrich the lives of children and young people fighting life-threatening conditions. Samuel was diagnosed with Coffin–Lowry Syndrome shortly after birth. There is no treatment and there is a chance Samuel will deteriorate as he gets older, but he has speech and language therapy and physiotherapy to help with his development. Ballyclare made Samuel a bespoke version of the Structural Firefighter tunic and trousers which it supplies to fire brigades throughout the UK. “These garments offer real firefighters a high level of protection in the dangerous tasks they face, and so Samuel was ready to face whatever his big day threw at him,” adds Carlton. Samuel’s Dad, Mark, said: “Samuel had so much freedom on the day – it was great as parents to see him have free run being a Firefighter and it meant we could just relax and enjoy it too. 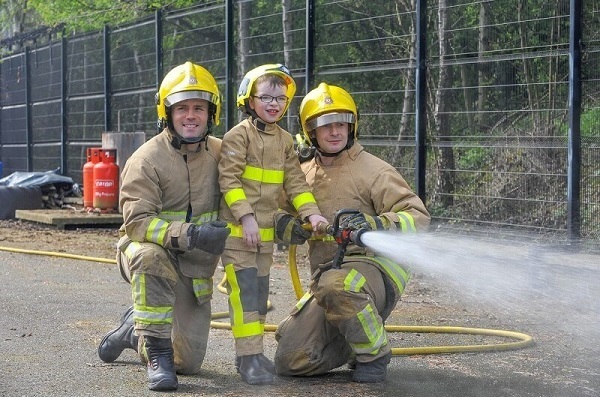 Picture caption: Stockport-based protective workwear manufacturer Ballyclare Limited provided nine-year old Samuel Hawthorne with a tailor-made firefighter’s uniform when he was granted his wish to be a firefighter, thanks to the Make-A-Wish® UK charity and the Northern Ireland Fire & Rescue Service. Ballyclare Limited is a designer, manufacturer and distributor of protective workwear clothing and has been supplying customers with a comprehensive range of industrial workwear, corporate garments, high visibility and waterproof/foul weather garments for over twenty years. In addition, Ballyclare Limited is a trusted supplier of specialist protective clothing to the emergency services and armed forces, and provides managed services which include garment supply, leasing, repair and laundering. 1. Make-A-Wish grants magical wishes to enrich the lives of children and young people fighting life-threatening conditions. 3. Make-A-Wish should be referred to as Make-A-Wish® UK in the first instance. Thereafter ‘Make-A-Wish’ is suitable. We would ask that you try to keep ‘Make-A-Wish’ on the same line.